1) Enter Page URL – This can be your own website URL or any random URL that you wish to scan for any issues. You can also enter your inner pages here. 2) Clicking on the + logo next to ‘Enter Page URL’ will enable the option to ‘Enter your Competitor’s URL‘. You can enter up to 2 competitor’s URLs here. 3) Enter Keywords – Enter keywords to know if they are optimized for the particular page. 4) Units Incurred – For each URL that you enter, you will be charged 5 units for the same. So if you’re entering only 1 URL, you account will be debited by 5 units. For 2 URLs (Your’s + Your 1 Competitor), 10 units and for 3 URLs (Your’s + 2 Competitor’s), 15 units. 5) Report Name – This is the name by which your report will be saved. You can modify it as per your requirement or let it remain the same. 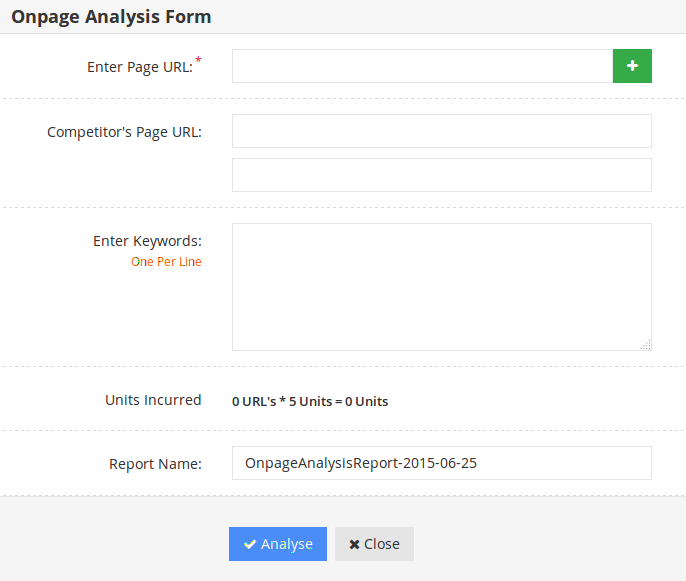 After you have filled the form, click on the Analyze button and wait for the report to get generated. This should take between 5-120 mins. You will see the status as ‘Processing’. Issues to be Fixed – Things that needed immediate attention. 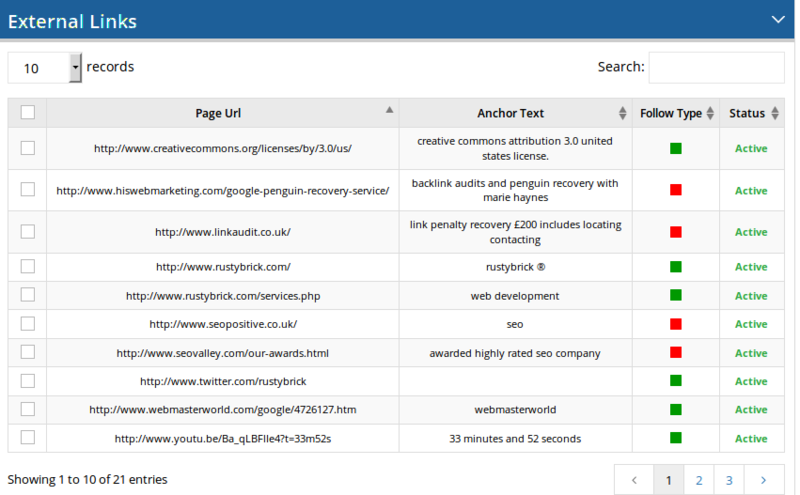 Internal Links – Links that go from the entered page to other different pages of your website. You can also get to know the anchor text, if the links are do-follow (green dot for do-follow and red for no-follow) as well as if the links are active or dead. You also have the option to select all/some of these URLs and add them to the URL basket for future use. External Links – Links that point to external sources from the page you entered. You can also get to know the anchor text, if the links are do-follow (green dot for do-follow and red for no-follow) as well as if the links are active or dead. You also have the option to select all/some of these URLs and add them to the URL basket for future use. Broken Links – Links that are no longer active. The details of broken links will be visible under the ‘Internal Links’ section. You only need to search for ‘Broken’ in the query box and the desired results will be displayed. 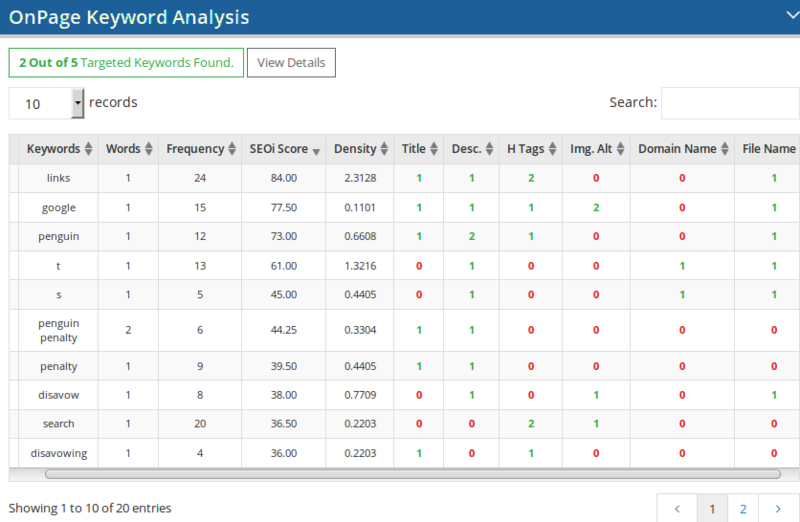 On-page Keyword Analysis – Shows how many of your targeted keywords were found on the page along with their frequency, SEOi score, density, whether they are present in the title and description, h tags, image alt. Attributes, domain name and file name. You also have the option to select all/some of these keywords and add them to the keyword basket for future use. The numbers in green show that your keyword passes the parameter i.e. it’s present in the title, description, image alt., H tags, file name etc. The numbers in red show that your keyword is not present in title or description or image alt. Frequency – Number of times the keyword is present on the page. 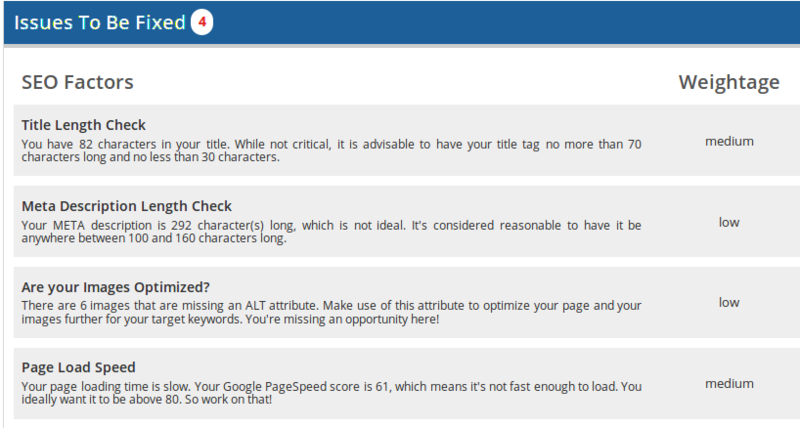 SEOi score – Score depicting the importance of a keyword on a page on a scale of 0-100. It’s calculated based on the frequency of repetition + the no. of places where the keyword is repeated. 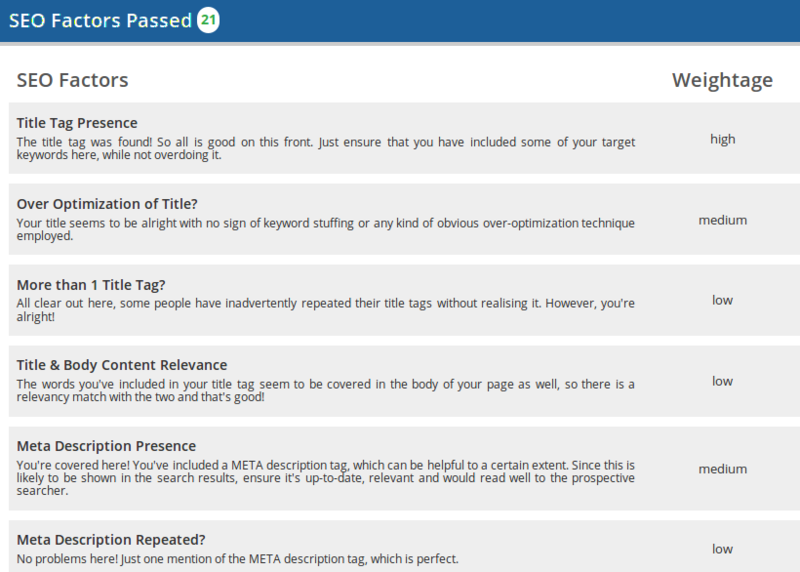 More weightage is given to mentions in headings and title tags as compared to mentions in the body of the page. A SEOi score of more than 50 implies the keyword has been given due importance on the page. Density – No. of times a keyword appers on the page compared to the total no. of words on the page. The ideal limit as suggested by major search engines is between 3-4%. Title – Technically called title elements – define the title of a document. Description – A 160-character snippet that provides concise explanations of the content of a web page. 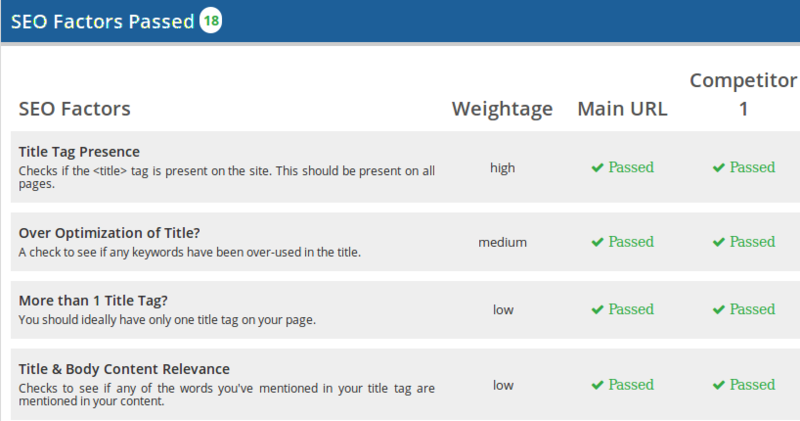 H Tags – These define HTML headings. Image Alt Tag – Specifies an alternate text for an image, if the image cannot be displayed. Social Metrics (of the URL that you enter in the form) – Shows the social presence on various networks. This should not be confused with the main social profile for which the stats will vary to a great extent. 2) SEO Factors Passed: Here you can see a comparison of various important SEO factors that are necessary for boosting up your website’s performance along with your rivals. You can see for yourself where you/your competitor’s have failed and where you/your competitor’s have made the cut. 3) Issues to be Fixed: This section will list out the issues that need immediate attention. 4) Comparative On-page Keyword Analysis: Here you can see which keywords are present out of those that you had entered in the form. Clicking on ‘View & Edit‘ next to the keyword, you will see an in-depth analysis of the keyword – like places where it is present – title tags, description, image alt. Etc for you and your entered competitor/s. 5) Social Metrics Analysis: Displays the social metrics for you and your competitor’s URL. 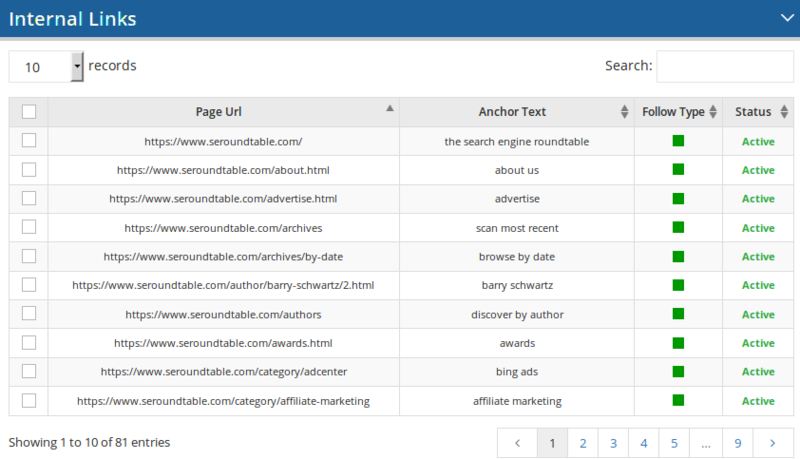 1) You can find out if your targeted keywords appear in the title, description, alt. tags, h1/h2 tags or domain name. If not present, you can work on this aspect so that your keywords appear at all the prominent places necessary for a SERP boost. 2) Social Strength – Through this you can find out how your page is performing in the social space. If the stats are way too low, then you need to promote your pages far and wide for more visibility and exposure. 3) Issues to be Fixed – Fix up the issues shown and you’re definitely on your way up the ranking ladder. 4) Emulate the best practices of your rivals to gain an upper hand in your respective industry. 5) You can also compare your page performance with your competitor’s and find out whose pages are optimized the right way for search engines as well as for people. So, what are you waiting for? Login now to your Mondovo account and start using the On-Page Analyzer tool to find out if your website is also making one of these 25 possible mistakes.